A few hundred thousand years ago during Earth's most recent ice age, a beefy subspecies of spotted hyena that was more than double the weight of its modern relative roamed Eurasia's snow-glazed terrain. Until their extinction about 11,000 years ago, these animals, now known as cave hyenas, would drag their prey into dens and devour them with bone-crushing jaws. An international team that includes researchers from the Department of Energy's SLAC National Accelerator Laboratory has now unearthed what life might have been like for these hulking creatures. They found that despite their massive size, some cave hyenas experienced times of hardship that affected them to the bone, causing areas of arrested growth that appear as dark lines, like rings on a tree trunk. The research, led by Children's Museum of Indianapolis paleontologist Jennifer Anné and published in the Journal of Analytical Atomic Spectrometry, is part of a larger effort that uses SLAC's Stanford Synchrotron Radiation Lightsource (SSRL) to map low-concentration, or trace, elements within bone, teasing out biological information about long-extinct animals. "This work, which offers new insight into the delicate chemical ballet within bone, could allow us to refine our understanding of environmental impact on vertebrates from the past and predict what will happen in the future," says Phil Manning, professor of natural history at the University of Manchester in the U.K. who is both co-author and head of the lab that undertook this research. In order to hold onto life-sustaining chemical elements, the body incorporates them into its skeleton, making sure they aren't leached away during everyday processes. Since bones are constantly changing, studying them gives researchers an opportunity to learn the life history of an animal from when it was first developing to what happened right before it died. "Your bone can take half the periodic table in its structure," Anné says. "That's one of the big purposes of having a skeleton: it's an important storage and release area for a number of elements you're going to use throughout your life. In our research, we try to find out what all the trace elements in bone can tell you about an organism." In her research, Anné examines scraps of bone that other researchers often throw away, which provides larger sample sizes and more freedom with how she can use them. The hyena, she says, came up as a random sample and morphed into something a bit bigger than she expected. At SSRL, the researchers used a technique called X-ray fluorescence, shining X-rays onto cave hyena bone samples to knock the innermost electrons out of the materials' atoms. When outer electrons jump down to take their place, the atoms radiate fluorescent light. Since every chemical element has its own signature wavelength of light, this technique allowed the researchers to map the distribution of elements in the bone. A similar technique done at the Diamond Light Source in the U.K. allowed them to better determine the concentration of each element. The bone fragments of the particular cave hyena featured in this paper, dated 40,000 years old, were found among a boneyard of different ice age fossils in a cave in England. 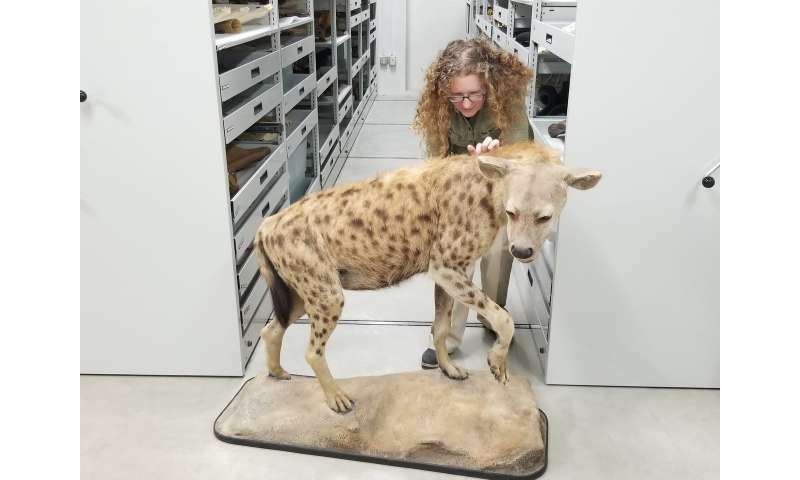 The researchers also used bones from today's spotted hyenas as analogs to make sure what they were seeing was in line with the modern organism and not something that leaked into the fossil from its external environment. 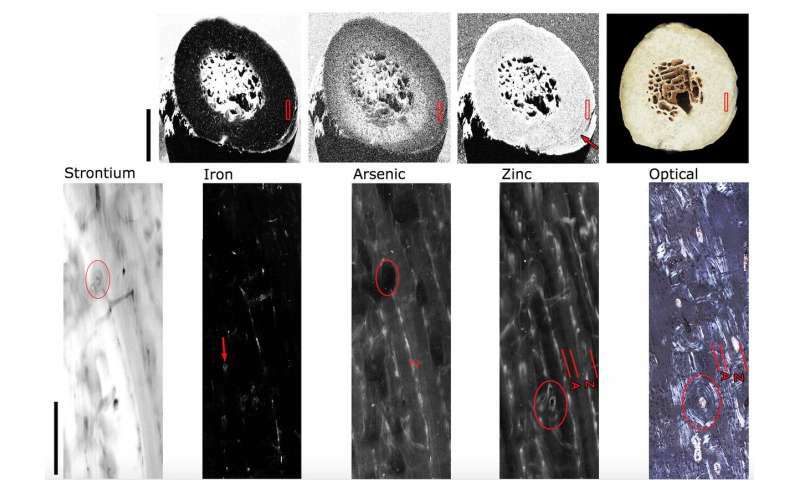 One of the elements the researchers were able to map was zinc, which is closely tied to bone growth. Cyclic bone growth patterns in fossils were already known to paleontologists, often observed as alternating zones of slow- and fast-growing bone. These zones allow researchers to reconstruct age, growth, diet and other lifestyle factors of extinct animals. When an animal has a constant supply of nutrients and minerals, bone growth steadily pushes outward, creating porous, zinc-rich zones. But when an animal's metabolism slows, perhaps due to periods of stress or starvation, so does bone growth, creating dense strips, or bone "rest" lines. Paleontologists believe these lines correspond to factors like alternating seasons and reproductive cycles. When the researchers mapped the zinc distribution and concentration in this particular hyena, they noticed thin lines that looked almost like pencil tracings, signifying areas of arrested growth. Modern hyena bones and cave hyena fossils from different sites and time periods did not show these lines, suggesting that this hyena experienced stresses that the others did not. "An animal that's dealing with ice age conditions might experience some really good times and some really rough times," says Nick Edwards, a SLAC scientist who is co-author and part of the research team. "We're not sure yet what the stressors are, but these lines at least show how the animal was dealing with them." To follow up on this research, Anné hopes to apply what she's learned to different tissue types in different species, both modern and extinct, to reach a better understanding of bone and what it can tell researchers about an organism. A recent upgrade to the SSRL beamline used in this research will allow the team to improve their images, measuring the whole spectrum of trace elements at higher resolution and zooming in on interesting areas without even having to move the sample. The current study is part of a series of research papers from the team that use the SLAC-based technique. One looked at fossils of a 150 million-year-old dinosaur called an Allosaurus and another looked at a 19 million-year-old manatee. "Together these papers show what trace elements can reveal about ancient species throughout a span of more than 100 million years," says Uwe Bergmann, a distinguished SLAC scientist at SLAC and co-author on the research. "We hope what we've learned will allow us to push even further back in time into the lives of other extinct animals." Not to get too pedantic, but the author seems to think "the last ice age" is over. It's not. The current ice age, defined as ice at one or both poles, began 2.4 million years ago. The latest ice outbreak was about 24,000 years ago, when glacial activity peaked; between 18,000 and 15,000 years ago, most of that ice melted. A "global warmup" has been going on for 18,000 years, although Peak Heat in this cycle likely occurred about 7,000 years ago --- temps have been stuck in a range for the past couple of thousand years. It remains to be seen if human-generated CO2 will lead to a break-out/breakdown.